Kunle Awobodu, the National President, Building Collapse Prevention Guild (BCPG), says there are over 1,000 buildings unfit for human habitation in Lagos Island. Mr Awobodu made the disclosure in an interview with the News Agency of Nigeria (NAN) on Thursday in Lagos. He told NAN that BCPG had brought such distressed buildings to the notice of the Lagos State Building Control Agency (LASBCA) for demolition. He spoke against the backdrop of a three-storey building located at Massey Street, Ita-Faaji, Lagos Island, that collapsed on Wednesday, killing some school pupils with many others injured. NAN reports that no fewer than 45 pupils said to be on the last floor of the building were rescued from the rubble. According to him, the collapsed building was one of the many buildings that were unfit for human habitation in Lagos Island. "There are over 1,000 distressed other buildings of this nature in Lagos, which, if nothing is done to demolish them, they will still collapse, resulting to more calamities in the state. "The collapsed building had been marked for demolition about three times, but the building regulatory agency has not demolished it. "We are moving round the circle and this has to stop. 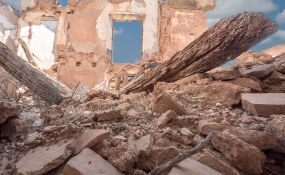 "Let the building control agency take the bull by the horn, by ensuring that all distressed buildings in the state are identified and demolished. "Let the state government look for preventive measures, rather than spending money for evacuation, investigation and remediation after the calamities and damages have occurred," Mr Awobodu said. He said that all the agencies responsible for monitoring buildings should be more proactive in discharging their mandates, if the issue of building collapse must stop. Mr Awobodu said that the architects, building engineers, bricklayers and the end-users must also live up to the expectations by complying with the construction rules and regulations guiding the industry. Also speaking, Adelaja Adekanmbi, the Chairman, Nigeria Institute of Building (NIOB), Lagos Chapter, called for a Town Hall Meeting, comprisimg the government, professionals, developers, and end-users in the built environment. Mr Adekanmbi said the meeting was necessary as a platform for comprehensive deliberation among the players, on how to tackle the issue of building collapse in Lagos State. According to him, all players in the industry have a role to play in addressing the issue of building collapse.